As a result of the Freeway Complex Fire in November 2008, all of the 30 foot tall invasive Arundo donax burned to the ground. HFE embarked on an effort to rid the Carbon Creek and the watershed of this water hogging, biologically useless plant that has clogged Carbon Creek for decades. A $5,000 grant kick started the effort. 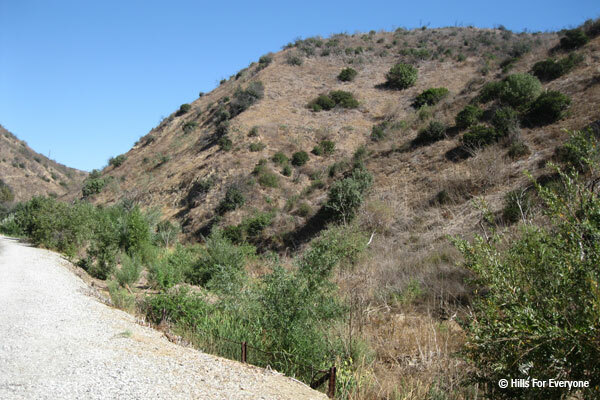 Many jurisdictions joined in on this opportunity to restore this creek in part because fire agencies reported the massive and highly flammable stands of Arundo carried the fire eastward and hastened its advance. Spraying and physical removal of the dead and dying Arundo continues even 10 years later and will continue for many more years. Many agencies and landowners have cooperated in its removal: Santa Ana Watershed Association, City of Brea, Carbon Canyon Fire Safe Council, Department of Fish and Wildlife, Department of Parks and Recreation, Caltrans, weed abatement and water quality agencies, fire departments, and private landowners. Arundo donax is a bamboo like plant that grows near streams. It is usually introduced as a stream bank protection and as a privacy screen. Because it contains silica wildlife cannot eat it. Because it does not branch, wildlife cannot nest in it. And because it uses up to 60% of the natural water in thick stands, wildlife lose a water source. Led by HFE, over $110,000 in grant funds have been received to remove this plant and are being implemented by the Santa Ana Watershed Association (SAWA).